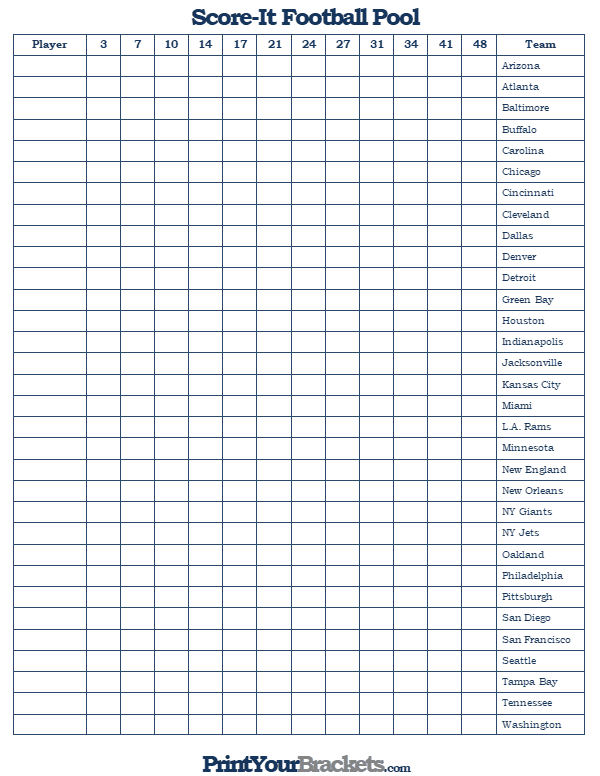 Below you will find our printable Score-It Pool. The overall idea of this pool is for a team to be randomly assigned to each participant and each time a participant's team has a halftime or final score of one of the corresponding numbers, the participant is awarded points. If at any point during the season a team matches all numbers, the participant is automatically declared the winner of the pool! A complete explanation is at the bottom of this page. If you're interested in running more full season office pools check out our NFL Survivor Pool, our NFL 33 Pool and our Even-Odd Football Pool. Begin by randomly drawing the participant names and write their name in the left column under the header "Player". The team on the same line in the right column will be that participant's team for the entire season. Ideally you would have 32 participants(1 team per player), or you could have 16 participants with 2 teams per player or 8 participants with 3 teams per player. Another option is to have a team draft as opposed to the random draw. 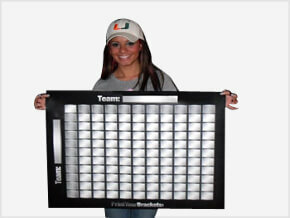 You will be using both the halftime score and the final score of each game. When a player's team scores one of the corresponding point totals on the grid, simply put a slash in that box. Add an additional slash for each time the point total is scored. At the end of the season you will multiply the number of slashes in each box by the corresponding number. Example: If Arizona scored 7 points 4 times during the season and 14 points 2 times during the season, the participants total points would be 56(7 x 4 = 28 and 14 x 2 = 28). The player with the highest point total wins! IF AT ANY POINT DURING THE SEASON A PLAYER/TEAM MARKS OFF ALL NUMBERS, THEY AUTOMATICALLY WIN THE POOL!